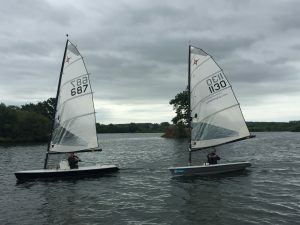 12 boats took part in the 2017 Supernova Open meeting. Winner overall was Tim Hand from Swarkestone with Peter Housley of Sutton-in-Ashfield second and Kevin Last of Attenborough third. 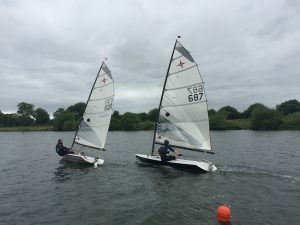 Held is a moderate force 3 to 4 wind there was some close racing although ultimately Tim Hand won every race. 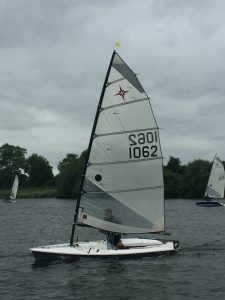 In the first race he had a close race with Gary Cawthorn until a coming together resulted in a broken tiller and retirement for Gary. 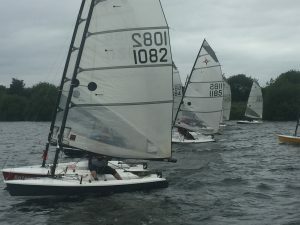 In race 2 a stunning start by Andrew Goodman saw him lead round teh first two marks before being overhauled by a few boats, finishing seventh. Gary finished second to Tim Hand. 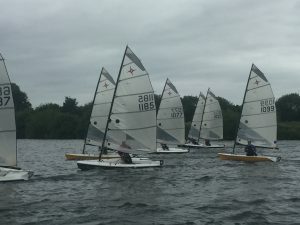 For the third race the wind was getting to the high end of force 4 and a few more capsizes resulted including by race leader Tom Chadfield who endured one of those typical Attenborough gybe/gyve scenarios where the wind changes as you gybe, resulting in a capsize to windward and eventual retirement. Tim Hand won quite easily in the end from Peter Housley and Rob Corner. Thanks to Race crew of Mike Pritchard, Andrea Murphy, Kevin Milton and Andrew Beaumont and galley crew led by Gillian Day and Paul Smith; Gillian’s lunch bags were particularly enjoyed.